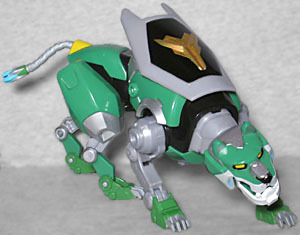 Representing the power of nature, the Green Lion guards and protects by creating Voltron's shield! In the 1984 cartoon, the Green Lion lived in a tree in the woods, because the lions all had environmental theming. For this reboot, it was on a different planet entirely, just hanging out on top of a massive ziggurat. It had been waiting there so long, in fact, that the jungle had overgrown everything - so home base might not have been a single tree, but she still hung out under foliage. 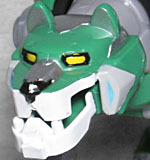 While the head is the same basic shape (ie, "lion-shaped"), the details are not a direct copy. The snout comes to a bit of a pouint in the front, instead of being entirely squared off, while the cheeks look like curving air-intake vents. The ears sit on top of the head, which may sound obvious, but that's as opposed to coming straight up off the sides. There's a silver panel on the bridge of the nose and another on the back of the head that makes it look like the lion is wearing the skullcap from Excalibur. Plus, there are dark circles around the eyes. There's a gap in the jaw, so the figure can hold things securely once it turns into the left arm of Voltron - additionally, the jaw is spring-loaded, meaning that if you want to see the access ladder and laser cannon that are sculpted inside the mouth, you'll have to hold it open. Other than that, the Lion can swivel its head, and move at the hips and shoulders, plus all four ankles, the elbows in the front, and two joints in the back legs. The tail can also swivel around, but that only means you can raise or lower it, not actually aim the cannon on the end of it. The arm-lions do get a swivel and a side-to-side hinge in their abdomen, as well, which can really make some more interesting poases. 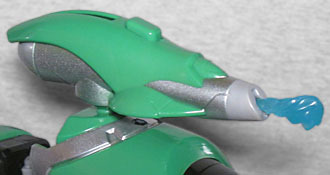 A panel on the chest hinges open, revealing a slot for the Green Lion's speeder. The speeders are the way the pilots travel to and access their Lions, and can also be used as personal transport vehicles in places where the Lions would be too big to go. They each have a different design, though Green's is almost the same as Blue's, just not quite as long. The official images of the piece show a lot more paint apps, even giving complete detail to Pidge in the pilot's seat, but I think we're lucky that the final product even bothered to paint the windshield. 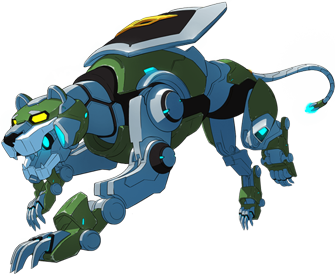 All the Paladins of Voltron are armed with a weapon called a "bayard," which transforms into different weapons based on their personal fighting style - Pidge's typical weapon is a short blade, like an ulu knife, that also functions as a grappling hook and a taser. When it's plugged into the Green Lion's control console, the Green Lion manifests a "Soul Surge cannon," which causes vegetation to erupt on whatever it strikes - basically a vine gun. 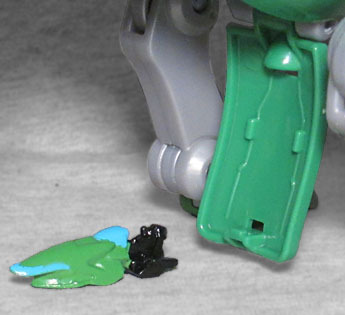 The toy includes the cannon, and it can plug into Green Lion's back; you just need to remove the black shield panel. It launches a translucent blue projectile, molded as a wedge-shaped spiral. If you buy this figure alone, you also get part of Voltron's sword - Red comes with the other half. The Green Lion has an inquisitive personality and needs a pilot of intellect and daring. 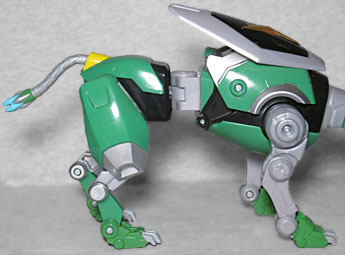 Even though Pidge favors technology over nature, The Green Lion recognized the connection between them. 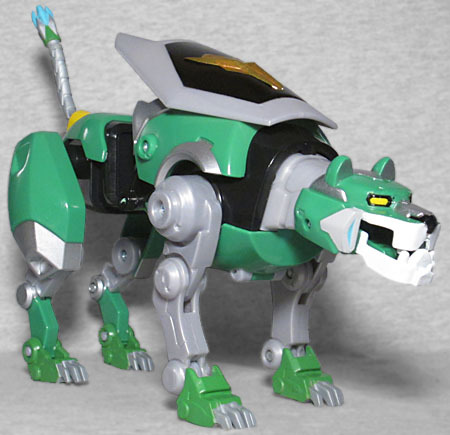 The combinable Green Lion toy is about 7½" long, not counting the tail, which is bigger than it really needs to be, but it'll definitely make an impressive Voltron once he's assembled.